Sign our open letter on Scotland's commitment to the SDGs! Scotland’s SDG Network is coordinating an open letter to Scottish Political Parties, Parliamentary Committees, the Scottish Cabinet and all 32 Local Authorities from organisations and individuals across Scotland. The letter calls on these key decision makers and institutions to show their commitment to delivering the UN Sustainable Development Goals in Scotland by publishing the specific actions they are taking that relate to the 17 critical areas reflected in the SDGs. In January 2016, Scotland adopted the UN Sustainable Development Goals, also known as the Global Goals. Since then, citizens, civil society organisations, business leaders and politicians across the country have tasked themselves to see that we achieved these goals both in Scotland and across the world. Scotland’s SDG Network is a coalition of people and civil society organisations committed to pursuing the SDGs and building awareness and engagement across Scottish society. Anyone can join the network. 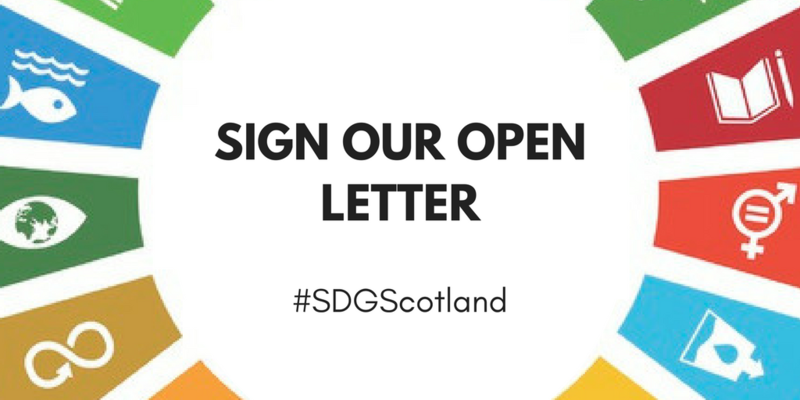 By signing our open letter at this crucial time, we can make sure that actions are taken in Scotland to see that the Sustainable Development Goals are achieved. Please use the co-signatory form that follows the letter. Any organisation and individual from the public, private or third sectors can sign the letter. Want a recap of why the Sustainable Development Goals matter so much to Scotland? Read a blog to find out more! We are writing to you at what we believe is a significant moment in Scotland’s commitment to itself and the planet. Neatly captured by the UN Sustainable Development Goals (SDGs), we invite you to join our ambition that the SDGs are achieved in Scotland and across the world. Scotland was amongst the first nations to sign up to the 17 SDGs, which are the closest the world has come to a strategy to end extreme poverty, fight inequality and tackle climate change. As a group of citizens and organisations committed to the human and planetary wellbeing of this generation and future generations to come, we support the implementation of the SDGs in Scotland. This January marks two years since the SDGs came into force in Scotland, and over this time citizens, civil society organisations, business leaders and politicians across the country have tasked themselves to see that we implement the SDGs both domestically and internationally. This initial commitment to the SDGs has been vital and should be applauded. Every Party Leader in the Scottish Parliament has pledged support to the SDGs and 100 of Scotland’s 129 MSPs have chosen one SDG they will champion in Parliament. However, now is the tough part – implementing the SDGs. From the development of a national website for the SDGs to a special pop-up exhibition and the inception of Scotland’s SDG Network, our organisations have worked to mobilise people in Scotland around the SDGs since their adoption. We now want to work with you to achieve a breakthrough in sustainable development in Scotland and overseas. Because of this, Scotland’s SDG Network – a coalition of people and organisations committed to pursuing the SDGs and building awareness and engagement across Scottish society – is calling on you to demonstrate your commitment to the SDGs and the specific actions [the ‘name of committee’/the ‘name of party’/the ‘name of government department’/’name of local authority’] are taking that contribute towards implementing the SDGs in [Scotland/name of local authority/overseas]. The SDGs are a call to action on the most serious and challenging issues facing our society and environment throughout the next decade. We invite you to respond to this letter with the action points your [committee/local authority/party/government department] are taking that relate to the 17 critical areas reflected in the SDGs. We will publish all responses in May 2018 in a report on our website: www.globalgoals.scot. The purpose of collating this information is to inform the direction of activities in Scotland relating to the SDGs two years on since they were adopted in Scotland. Ahead of this time, please send your response no later than April 2018 to globalgoals@scvo.org.uk. We look forward to hearing from you on your commitments to delivering the SDGs in [Scotland/name of local authority areas/overseas], and we would welcome the opportunity to meet with you to discuss how we can move ahead with a Scottish plan to see that we achieve the SDGs. We thank you in advance for your support and look forward to working with you.